Instructions For Use And Safety – Nexamo Technoplast Pvt. Ltd. Apply the tourniquet to the upper arm. Twist and remove white cap of needle. Screw holder securely onto needle. Twist the colorized cover of needle and pull off. Perform venipuncture. Push vacuum tube into the holder, and make the needle puncture the rubber stopper. The vacuum inside tube allows the required quantity of blood of flow into the tube. Wait until the blood stops flowing in. Pull out the tube from holder. Repeat STEP 4 if any need of other specimen collection. For proper additive performance, gently invert the tube 6-8 times immediately after blood collection. DO NOT SHAKE! Dispose of needle into nearest sharp container. Do not re-cover the needle. 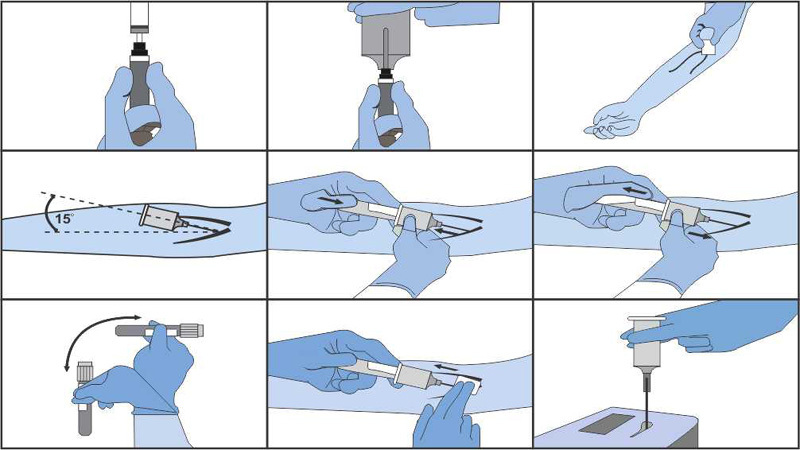 The quantity of blood drawn varies with local altitude, ambient temperature, barometric pressure, tube age, venous pressure and filling technique. Use gloves, gowns, eye protection, and other personal protective equipments to protect from blood splatter, leakage, and potential exposure to bloodborne pathogens. Overfilling or underfilling of tubes will result in an incorrect blood to additive ratio, and may lead to incorrect analytic results or poor product performance. Pls pay attention to the below points, which may cause specimen invalid. The blood cells are crushed by outside force when pushing the blood into a tube with a syringe. The state of hemolysis may be caused in the first tube, if the needlepoint, doesn’t enter vein exactly. Shaking the specimen during mixing or transportation. Collect blood from a swollen vein. Insufficient blood specimen causes the concentration of additive too high. The blood cell is forced to be hemolysis because of the change of penetrative pressure. During centrifuging, stop and separate blood with stick, or the temperature inside the centrifuge is too high or too low. Not mix immediately after blood-sampling. The blood quantity is more than the stated volume when using a syringe to infuge the blood into the tube. Syringe is not suggested for all vacuum blood collection.